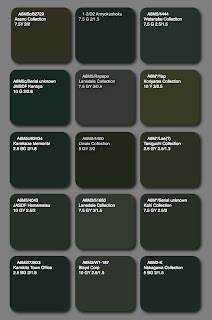 Courtesy of Japanese researcher Katsushi Owaki here is a display of rendered dark green chips from extant Zero artifacts in various collections, together with an example of the colour standard chip for Anryokushoku (Dark Green Colour) 1-2 in the 8609 document and D2 in KariKi 117. The greens show considerable variation from dark grey-green through dark olive to rich, dark blue-greens. Oh no! Just when I thought that if I was able to find a color/paint for early Zero's I would be safe, and that painting a kit of the later marks would entail no to little pain, here this comes down the pike. I half suspected as much. It only makes sense really, if it is difficult to figure out the early paints, that the later paints would give us fits too. Thanks for posting this, I look forward to reading more debate and research on this subject as always. Kit Trivia - Yet Another Veteran Zero!